Brett Lawrie flirts with a model while enthusiastically gripping a bedazzled phallic object. I'm not going to discuss the story that this picture comes from. The Toronto Star does a decent job of that, as do the bloggers that they link to in that article. No, I just wanted to post this picture of Brett Lawrie and one of the Victoria's Secret Angels, because it's both hilarious and shameless. How Lawrie continues to allow himself to be photographed like this, especially after all of the other embarrassing pictures that have been leaked to the internets - pictures that initially had Jays fans questioning his judgement and, uh, "make-up", to put it euphemistically - boggles the mind. At the very least, they could pair the ballplayer Brett with a female ballplayer - match an athlete with athlete. "Well, who could that possibly be?" you say? Well, at least one name springs to mind immediately. 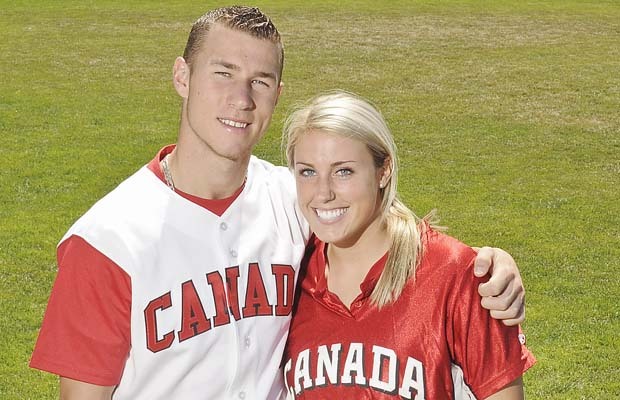 And Brett Lawrie has even taken pictures with her before! That's Brett's sister, Danielle, btw. Can't find a photo credit.